This airport article is a stub. You can help the wiki by expanding it. Lelystad Airport is an airport near Lelystad, the Netherlands. It is the biggest general aviation airport in The Netherlands and is also home to a large aviation museum, the Aviodrome (Aviodrome Website), which hosts the largest Flight Simulator event in the world periodically. The museum's former KLM Boeing 747-200 which they have on display is a prominent feature on the airport. 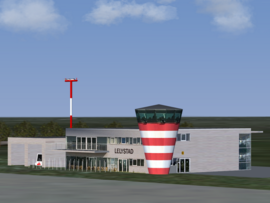 An expansion of the airport is planned in 2010 which would allow mainly budget airlines, holiday charters and regional airlines using aircraft such as the Boeing 737 and the Airbus A320 series to operate from Lelystad. The expansion would include a longer runway, 2100 meters long, and facilities to handle the bigger aircraft and approximately 2 million passengers. Lelystad and surrounding area can be found on scenery tile e000n50/e005n52. This page was last modified on 19 March 2012, at 15:35.